The Transducer converts the A.C. 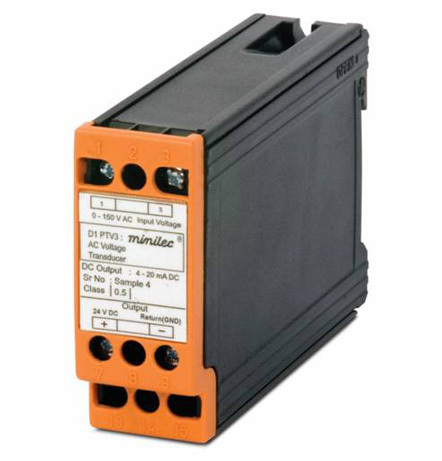 Input current or Voltage signal to a 4-20mA D.C. Output. The output is directly proportional to the input signal. 2 Wire Transducer obtain the power to operate from the 4-20mA output circuit to which they are connected, and therefore require no separate auxiliary supply. It is average sensing RMS calibrated current Transducer. 2 Wire Transducers have an advantage over conventional auxiliary powered transducer, because no separate auxiliary is required, savings in the cost of providing a separate auxiliary supply and wiring are made. The above Transducer can be used to measure current or voltage in energy management systems, switchboards, generator and telemetry controls. Isolation of 2 KV is provided between the input and output signal, allowing the output to be fed to conventional analogue meters, digital meters, PLC, and computer systems. Response Time Less than 500 mSec. Input / Output Isolation 2 KV 50 Hz for 1 min.